What would eventually become The Society of St. Sulpice began quietly in Paris. Founder Fr. 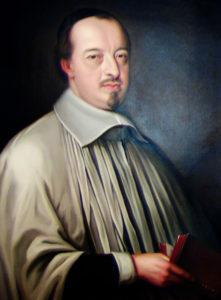 Jean-Jacques Olier had established a seminary and a community of priests in 1641. When he became pastor of the Church of St. Sulpice in Paris in 1642, he moved the seminary to the parish—and The Society of the Priests of St. Sulpice was created. After Fr. Olier described his model of a seminary to the Assembly of Clergy of France in 1651, bishops throughout the country asked the Sulpicians to oversee the operation of their seminaries. Fr. Olier died in 1657, but his ideas lived on. More than a century later, in 1791 the Sulpicians expanded from France to the United States. What would later be called St. Mary’s Seminary opened in Baltimore with four Sulpicians and five students, creating the first Catholic institution of higher learning to open in the U.S. Pope Pius VII gave St. Mary’s the right to grant ecclesiastical degrees in 1822, the first institution in the U.S. to be given that distinction. The early 1800s marked a turning point for women and African-Americans in the Church. In 1808, the Sulpicians at St. Mary’s Seminary assisted Elizabeth Ann Seton in her founding of the Sisters of Charity. In 1829, Sulpician Fr. James Joubert worked with Mary Lange, a Haitian immigrant, to establish the first community of black sisters in the U.S., the Oblate Sisters of Providence. This period coincided with the founding of Mount St. Mary’s Seminary and College in Emmitsburg, Maryland, in 1808, which remained a Sulpician institution until 1826. Throughout the 1800s and 1900s, the Sulpicians assumed direction of and established seminaries in the United States and abroad, including The Sulpician Seminary in Washington, DC, which would later become Theological College, The University Seminary at The Catholic University of America. U.S. Sulpicians began a collaborative approach to priestly formation with the bishops of Zambia in 1989. In 1995, the Sulpicians assumed direction of Emmaus. Spirituality Centre, a propaedeutic formation program in Lusaka, Zambia. Today, the Sulpicians have much to celebrate. 2008 marked the 400th anniversary of the birth of our founder, Fr. Olier, and 2014 marks the 25th anniversary of the arrival of the Sulpicians in Zambia. 1631: Fr. Olier publicly commits himself to a life of devotion to God and service to the poor. 1641: Fr. Olier establishes a seminary and a community of priests; he moves to Paris the following year, bringing the petit compagnie with him. This seminal community would later be established as The Society of the Priests of St. Sulpice. 1651: Fr. Olier describes his model of a seminary to the Assembly of Clergy of France. Bishops throughout the country ask the Sulpicians to run their seminaries. 1657: The death of Fr. Olier. Sulpicians expand to Canada and soon participate in the evangelization of the native peoples in present-day Canada and the U.S.
1790s: Eleven Sulpicians, later beatified, are martyred during the French Revolution. A small cadre of French Sulpicians arrives in the United States to continue their ministry abroad. 1791: From humble beginnings, St. Mary’s Seminary opens in Baltimore, Maryland. 1808: The Sulpicians at St. Mary’s Seminary help Elizabeth Ann Seton in the early stages of her apostolate with the Sisters of Charity. 1829: Sulpician Fr. James Joubert works with Mary Lange, a Haitian immigrant, to establish the first community of black sisters in the U.S., the Oblate Sisters of Providence. 1884: U.S. Sulpicians assume direction of St. John’s Seminary in Brighton, Massachusetts, where they remain for 27 years. 1888: The Sulpicians, Canadian Province, open the Pontifical Canadian College in Rome. 1896: U.S. Sulpicians assume direction of St. Joseph’s Seminary in Dunwoodie, New York, where they remain for 10 years. 1898: U.S. Sulpicians assume direction of St. Patrick’s Seminary in Menlo Park, California, where they remain for 118 years. 1917: U.S. Sulpician Seminary opens in Washington, DC. 1923: U.S. and Canadian Sulpicians become independent provinces. 1929: Fr. Jean Verdier, a Sulpician priest, appointed archbishop of Paris and, shortly afterwards, cardinal. 1930: U.S. Sulpicians begin responsibility for St. Edward’s Seminary in Seattle. They remain in Seattle until the Archdiocese closes its seminaries in the 1970s. 1930s: Sulpicians in the U.S. begin to seek civil accreditation for the academic programs in their college-seminaries, The Society of St. Sulpice, internationally, assumes ministry in Vietnam, Japan, and China. 1940: The Sulpician Seminary in Washington, DC, is reconfigured as Theological College, the university seminary of The Catholic University of America. 1960s: U.S. Sulpicians begin to cooperate with Canadian Sulpicians at seminaries in Latin America. In 1961, Peter Saburo Hirata becomes the first Japanese Sulpician bishop. In the aftermath of The Second Vatican Council, the Ecumenical Institute of Theology is established in 1968 at St. Mary’s Seminary & University, Baltimore. In that same spirit, U.S. Sulpicians develop and incorporate formal pastoral placement programs as a constitutive component of their seminary formation programs. 1970s: Sulpicians develop and establish the first pre-theology program in the U.S. to serve as a propaedeutic period of formation for those men who lack essential preparation. In 1975 Barthhélémy Nguyên Son Lâm becomes the first Vietnamese Sulpician bishop. In 1978, The Society of St. Sulpice, U.S. Provinces assumes the administration of The Vatican II Institute for Clergy Formation in California, the oldest sabbatical program for Roman Catholic priests in the U.S.
1989: After wide consultation and prayer, the U.S. Province of Sulpicians widens their apostolic ministry to include the Central African country of Zambia. 1995: Pope John Paul II blesses the cornerstone for the new Center for Continuing Formation at St. Mary’s Seminary and University in Baltimore. 1996: For the first time a U.S. Sulpician—an American—Fr. Lawrence B. Terrien, PSS, is elected Superior General of The Society of the Priests of St. Sulpice. 2008: Fr. Ronald D. Witherup, PSS, becomes the second American Sulpician elected as the Superior General of the Society of St. Sulpice. 2009: Fr. Thomas R. Ulshafer, PSS, is elected as the Provincial Superior of the U.S. Province of Sulpicians. 2015: Fr. John C. Kemper, PSS, is elected as Provincial Superior of the U.S. Province of Sulpicians. 2016: The Society of St. Sulpice, Province of the U.S., celebrate the 225th Anniversary of the arrival of the Sulpicians in Baltimore.